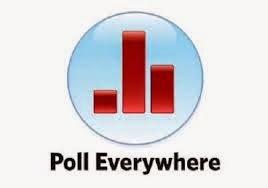 I used the polleverywhere.com system for the first time today at Indian School of Business -- all seemed to work nicely, except that the polls would not show up in my PPT. Perhaps b/c I loaded PPT 2007 instead of 2010. In any case, I quickly moved to my browser, where I could display the polls online. Testing again in my office after class looks fine, so I will report back after the Thurs class. Students seemed to like the system, and all figured out the online or SMS business after a few slides. In fact, some liked it so much that they kept entering more and more answers - I had to "Close Poll" to get back the attention. One main difference from clickers is that everyone sees the answers as they come in, so later students can see what the earlier students selected... Herding effects? Regarding the "herding effect": I am intending on using polleverywhere for an elementary school. I believe that the students will be mesmerized by the constantly moving bars and will strive to manipulate the bars rather than provide their real answer. To combat this, I will freeze the projector screen as soon as I show the poll. Thus, I'll be able to see the results and will then unfreeze so they can see the results. There's an easier way to avoid the real-time updating of the bars in PE: Change the look to a table. The table does not show the answers, only the number of responses as responses come in. Then you hit "close poll" and switch to graph mode.